Bed Bugs have made a strong comeback here in the New York area. There are many concerned people out there and they have good reason to be! If bed bugs can get inside, they will thrive regardless of how clean your home or business is. Their bites are extremely painful and unsightly, though they do not transmit diseases. But don’t worry. Our bed bug exterminator Long Island team knows how to discretely deal with this problem so that it doesn’t have to be a nuisance or an embarrassment. What are bed bugs? What do bed bugs look like? Bed bugs are small, oval, wingless insects that reach about 1/4 inch in length. They belong to the insect family Cimicidae, which includes three species that bite people. Bed bugs have flat bodies and are reddish-brown in color. They may sometimes be mistaken for ticks or small cockroaches. Bed bugs feed by sucking blood from humans or animals, and they live in large groups, so a bed bug exterminator Long Island professional should be called right away if you find even one bed bug in your home. They do not develop wings and cannot fly. Still, these critters are persistent and invasive. That’s why our Long Island bed bug exterminators take them extremely seriously. Bed bugs were common in the U.S. before World War II and became rare after widespread use of the pesticide DDT began in the 1940s and 1950s. Now, bed bugs can live and thrive even in clean environments. However, they are more easily spread in crowded living quarters where it’s easy for them to hide and breed. 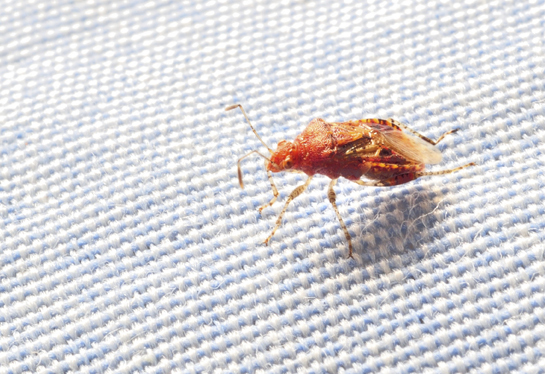 Our bed bug exterminators Long Island technicians know exactly where and how to find these troublesome pests. We know where they hide and how to get to them so that the stop coming out at night to bother you or your tenants. Bed bugs can live in any area of the home and can reside in tiny cracks in furniture as well as on textiles and upholstered furniture. Most Long Island bed bug exterminators have found that they tend to be most common in areas where people sleep and generally concentrate in beds, including mattresses, box springs, and bed frames. Other sites where bed bugs often reside include curtains, the corners inside dressers, cracks in wallpaper (particularly near the bed), and inside the spaces of wicker furniture. Since bed bugs can live for months without feeding, they can also be found in vacant homes. That’s why it’s a great idea to have our bed bug exterminators Long Island team come in for an inspection when buying or renting a new home. This will save you in major expenses and aggravation later on. Getting rid of bed bugs is not an easy process for any bed bug exterminator Long Island team. A variety of methods must be used to eradicate bed bugs. These must be applied to all areas of the indoor property where the bugs are observed as well as spaces where they might possibly crawl or hide. Unfortunately, pesticides alone will not remove all bed bugs from your home or business. Interestingly enough, more bed bugs are found off the bed than on. All areas need to be inspected by bed bug exterminators Long Island professions, and the bed bugs must be physically removed using an industrial HEPA-equipped vacuum cleaner. This requires closely inspecting mattresses, box springs, computers, chairs, books, cable boxes, furniture, and just about anywhere else there is a crevice. Frequently Asked Questions About Bed Bugs. A: Yes, they are visible & will be more visible when they are engorged with blood. A: They are attracted to warmth & CO2-the same as mosquitoes. Q: Are they only found in bedding? A: Although bed bugs prefer warmth, they can be found anywhere there is a crack or crevice. Q: How did I get them? A: They were carried in or traveled in from another apartment. They could have been picked up from visiting places like hotels or movie theaters. Q: Can animals be infested with them? A: Yes, they will feed on animals in the same way as humans. Q: Do they carry or transmit diseases? A: As far as entomologists know, they will not carry or transmit diseases. Q: What exactly do they feed on? Q: How long can they live without a meal? A: 3 months or longer. Q: How do I know if I have a bed bug problem? A: You’ll know for sure when you see them or when you have bites on your body. Q: Can I exterminate them myself? A: You can try, but it is very difficult and usually requires a professional service such as Pest Pro. Q: Why is it more costly to treat for bed bugs? A: Exterminating bed bugs is an extremely labor intensive job. The first treatment of a home may take a day or more to complete..